Jogging may be considered as a sports-oriented exercise for healthy people only. Today, I am going to tell you that jogging rejuvenates your brain and I recommend a very simple, easy, and fun jogging tips applicable to small schoolchildren to very old senior citizens as a health-building exercise. Jogging is just like a miracle magic—drink well, eat well, chat and talk well, and run well. Jogging is generally considered to build leg muscles and burns excess fats. My answer is “Yes” for sports-oriented people, and “No” to common people. Here is a type of jogging that I've learned from some traditional healers. It was tested scientifically by renowned doctors that can benefit people of all ages. An easy jogging is an important factor for common people to enjoy and continue doing it. This traditional form of jogging can reduce blood sugar, blood pressure, urine acidity, increase brain functions, and many other benefits that you can achieve. What form of jogging is this? It is as simple as not using your “thigh muscles” when jogging. 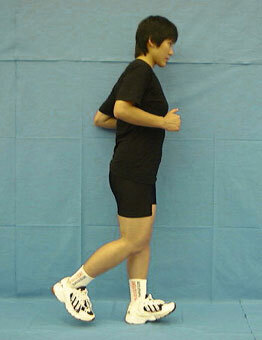 If you do not use your thigh muscles, you can run as long and as far as you want. You won't get tired at all. Besides, lactic acid won't increase as you might think! So how can you jog without using your thigh muscles? The answer...run slowly. Slow jogging is the ultimate answer! Jog for 4–5 kilometers or 3 miles per hour. Yes, it seems like walking but don't walk. Jogging at the speed of walking is the secret! Jogging consumes about twice more energy than walking. It means that if you jog slowly for 20 minutes a day, you can burn as much as 6 kilograms or 13 pounds of fats. Scientific analysis shows that slow jogging increases capillary blood vessels around the interior muscles. The increased size and vascularization of blood vessels would result in more oxygen and blood that are provided to the muscles. This means that you will be more capable of running in longer duration. Slow jogging can also burn sugar and fat efficiently. Slow jogging reduces stress, so you won't get angry easily. Less stress improves brain functions. In fact, brain analysis shows that functions of the brain as well as its size are growing dramatically in less stressful environment. Yes, slow jogging can help prevent diseases of elderly people such as Alzheimer's disease, dementia, and of course, it helps increase the learning capability of young generations. Slightly bend your head forward. Just press your foot forward. Smile and chat while jogging. Jog for about 10 minutes 3 times a day, or 30 minutes per day. As soon as this article was posted, we suddenly receive overwhelming e-mails especially from young athletes, elderly people, and sickly people, who are eager to know more about jogging. The most common question was on how to reduce loads to the hip and knee. To do this, just keep in mind that the stepping distance should be short and avoid making loud sound of shoes. With these two simple techniques, your jogging will improve two to three times better. Questions like 'how to avoid getting tired or how to keep jogging long every day especially for overweight or obese people', and 'are there any alternative methods of jogging without running inside the house or for bedridden', were also brought up. Yes, there are easy ways to achieve these. Can you believe that these are as good as outdoor jogging? Of course, we have done medical and scientific researches and recorded the results since several years ago. As you can see from the illustrations above, simply do up and down steps for about 10 minutes, 3 times a day, for beginners. 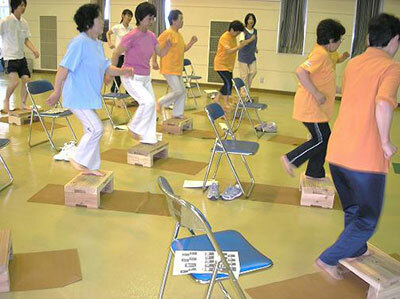 With this step exercise, 50 volunteers suffering from metabolic syndrome lost about 2.5 kilograms (5.5 lbs.) of weight and reduced waist size of 5 cm (2 inches) less, in just less than two months. Apart from that, visceral fats reduced 18%. Isn't that great? This simple exercise may eliminate the use of cane by elderly people, because it will make your bone structure strong, and may also get rid of lower back pain. Remember, don't rush! If you are just starting, begin from a very slow motion. 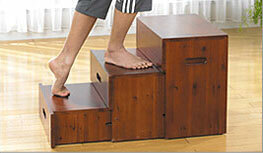 You can gradually increase the speed of your up and down step until you can do around 80 times per minute. Probably, 10 minutes per session and 2–3 times a day. However, it does not mean that you have to do it 80 times per minute. It will also depend on your age and physical condition. Of course, this is not the equivalent of jogging outdoors but it will help a lot for people who cannot do it outdoors. After jogging or after doing strenuous exercises your lactic acid in the blood increases. However, if you continue jogging slowly or slowly doing up and down steps for several days, you will notice no tiredness and the lactic acid in your blood reduces more than 20%. A good rule of thumb for the speed of jogging is that you should be able to talk to each other while jogging. 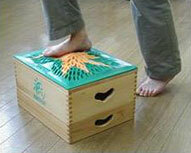 We recommend doing the up and down feet exercises for elderly people or for people with disabilities. These simple exercises can help a lot. If you do it altogether with music, wouldn't it be a great fun in rejuvenating our health?